Cody Knapik has been serving as supply pastor of Garnett UB church (Garnett, Ks.) since February 2014. He took the place of Anne Loewe, who retired after serving at Garnett for 14 years. Missions Moments – Easter 2014 from Global Ministries on Vimeo. It may not seem like Easter is just around the corner, but it is. 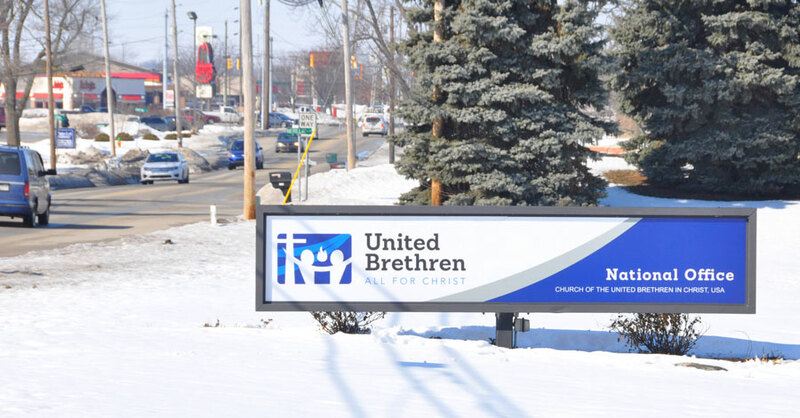 In the coming weeks, United Brethren churches will receive bulletin inserts and other materials for our annual Easter Missions Offering. Nicaragua: completion of the new conference center in Masaya. Sierra Leone: continued renovations at Mattru Hospital. Along with the inserts and other materials your church may have requested, we will send a DVD promotional video. You’re welcome to preview the video above. Five persons from Blue Rock UB church (Waynesboro, Pa.) went to Honduras on Sunday morning, February 23. Three more persons leave on Friday morning, February 28. This work team will help Juanita Chavez, superintendent of Honduras Conference, enlarge a building at the national compound in La Ceiba. They will return to the States on Saturday, March 3. Next fall, Huntington University will begin offering a major and minor in criminal justice. Many of the needed courses were already offered in the psychology, sociology, and social work programs. “It was a matter of packaging them the right way and adding two or three others,” said Dr. Del Doughty, interim vice president of academic affairs. Union Chapel UB church Fort Wayne, Ind.) is planning a work team for July 5-12. They will work on the dining complex in Jamaica at Regent College of the Caribbean. There is room for several more on the team. Cost is $800 plus airfare. You must have a valid passport to go. If interested, contact Dwight Kuntz at d.e.k.63@live.com for more details. As of today, total cost to leave from Fort Wayne, airfare and expenses is $1300 – $1400. The quicker we can buy tickets, the cheaper. A child goes missing from the children’s department. A violent or unstable person disrupts your place of worship. A person becomes seriously ill during service. A non-custodial parent takes their child from a classroom. Your receptionist is confronted by a hostile person. A person shows up at church with a gun. 25 Feb March 6 – Robert Rogers in Columbia City, Ind. 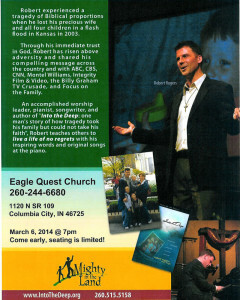 Robert Rogers will share his testimony of “No Regrets” at Eagle Quest UB church (Columbia City, Ind.). In August 2003, Robert’s wife and four children died in a flash flood in Kansas. The family was returning from a wedding in Wichita when a six-foot wall of water inundated their van and swept them off the highway. His eight years as a father and 12 years as a husband came to an end. Soon after, Robert resigned from his engineering career and began sharing his story, teaching people to “Live a Life of No Regrets.” He has remarried, and once again has two sons and two daughters. Robert is an accomplished worship leader, pianist, and songwriter. He has shared his story on ABC, CBS, CNN, Montel Williams, the Billy Graham TV Crusade, and Focus on the Family. “Before we left for vacation, we asked for prayer for Steve as it was discovered when he went in to the doctor because of the flu that his heart was beating out of rhythm, called Atrial Fibrillation. He was to go to the cardiologist the day before we left for vacation, but with the large snowfall the night before, were unable to do so. The appointment was rescheduled for Tuesday, February 18. 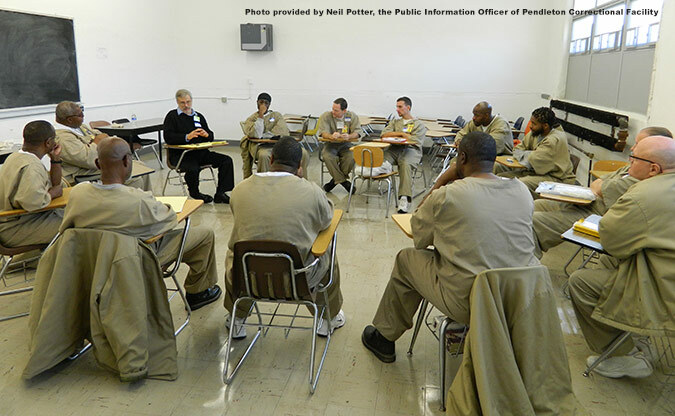 Dr. Jack Heller leading a discussion of Shakespeare with inmates at Pendleton prison. After volunteering with Shakespeare Behind Bars for seven years and conducting four different summer seminars with their program, Dr. Jack Heller (right) decided it was time to pursue his own prison program in Indiana. Heller is assistant professor of English at Huntington University. This fall, Heller began a program to guide inmates through the study and performance of Shakespeare at Pendleton, a maximum-security prison near Indianapolis that has over 1800 inmates. The program seeks to increase the cultural opportunities of the inmates while using Shakespeare to help them re-examine their lives. Currently, the inmates are working on “Coriolanus,” the last tragedy written by Shakespeare with anger as the central theme. Because this program is so new, the men are currently approaching the play as a readers group. They will eventually work toward a performance of some kind. “I would like for the men to wrestle with what roles they are assuming,” he said, explaining that many times when an inmate chooses a character, he can become conflicted because it will resonate with his past life. Heller said that he would like to take groups of Huntington University students to Pendleton like he did with the Shakespeare Behind Bars program. The original sign (top) dates back to the 1970s. 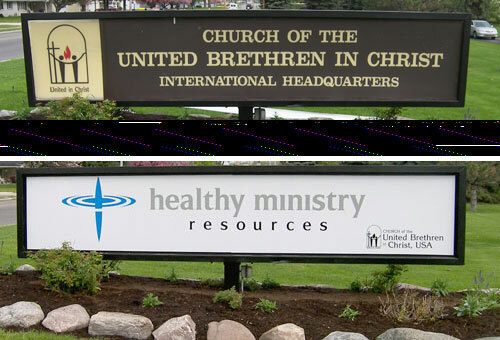 It was replaced in 2008 with the Healthy Ministry Resources sign. 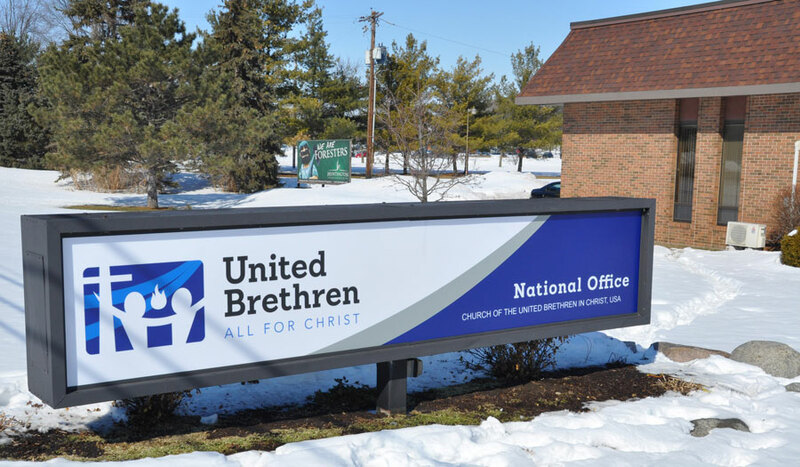 That year, the national office went through a branding process, and adopted the name “Healthy Ministry Resources” to refer specifically to the national office. That name never really caught on and is being phased out. Most people simply refer to the national office as, well, the national office. So we’ll go with that. Although the name of the office building has changed, it’s mission remains the same: “to effectively resource pastors and congregations of the US National Conference to fulfill the Great Commission.” That was central to the idea behind Healthy Ministry Resources, and it will continue to be the focus of the national office. Global Ministries (the United Brethren missions entity). The biennial US National Conference.